Congratulations to all the winners. WTG ! Is there a separate chat, or will the winners be announced here? I'd love to read The Rancher and The Renegade! I really enjoy these scavenger hunts! It's great finding authors and books that are new to me. I found 3 books that stuck out to me, which were: Untrue Colors, Unmasking Love, and The Need. Thank you so much! I cannot wait for the next hunt! On Nov 01, 2015, HollyCollyDolly said: Enjoyed! Enjoyed the hunt! Lots of new authors to check out. Thank you so much! I'm so excited to check out all these authors and their books!! I love these hunts, I always find more great reads, and Authors, galore, Thank you,! I found so many new authors and books to enjoy. So awesome! Thank you and Happy Halloween! On Nov 01, 2015, tinalou said: Happy Halloween!! Awesome giveaway!! Love several of the author and excited to find new authors. On Nov 01, 2015, Tara W said: Fun Hunt! Thanks to you I put so many books in my Amazon Wish List. darn it you are killing me with these books. I'd love to have a bunch of these. On Oct 31, 2015, barbarawr said: Thanks for the giveaway! This was exactly what I needed to motivate me to find some new authors to read! Thanks so much! On Oct 31, 2015, Lissasue said: Great contest! There's so many great authors that I would be extremely happy to win anything. This is a wonderful win. I would be happy with any of the prizes. Thanks. On Oct 31, 2015, becjames said: Hallowpalooza! I enjoy finding and filling in the blanks! This was fun! On Oct 31, 2015, Debskm said: Just Wow!! Found some new authors I have not read as of yet. Looking forward to more great books. Thank You for the great contest. On Oct 31, 2015, TrinaC said: Can't Wait!! Haven't read any of these books, but will be adding them to my TBR pile! Loved this and got to read some great excerpts for some books that I now have on my "to read" list. On Oct 31, 2015, proudarmymom said: So many great books!! Great contest, and a great way to introduce new authors. On Oct 31, 2015, justwin said: So many to choose from!! What a great contest with some great books highlighted!!! I like Death Fricassee, The Projector Project, and Unmasking love as just a few of my choices. On Oct 31, 2015, chrisreads said: Awesome contest! Thank you for such a wonderful contest. I can't wait to read so many of these great books! so many books to choose from! The one that I'm looking forward to is Cheryl Bolen's. On Oct 30, 2015, jsss said: love to read! I love getting a chance to peek into books and finding out that I need to add some of these books to me 'want to read' list! On Oct 30, 2015, Taswmom said: Wow! Thank you for introducing me to so many books and authors I didn't know. This contest alone could give me an entire tbr list. Always too many to choose from. Love the contests. Love reading all the excerpts and discovering new books in new genres. I'm most excited to read "The Protector Project" by Jenna Lincoln. On Oct 28, 2015, Taswmom said: Wonderful! I love these kind of contests, because I find so many authors I didn't know about, and soooo many new books for my wish and tbr lists. Plus, maybe I'll even win one! On Oct 28, 2015, PamCraig said: Thanks for the giveaway. I already bought one of my finds. Jennifer Snow's Breaking Her Rules. Look forward to reading it. On Oct 27, 2015, msdebms said: Squeee! I found a Zoe Dawson book I didn't have. Squeee! I found some interesting books to read. Thank You for the awesome hunt. I would love to read Chasing Victory by Joanne Jaytanie, and Bear Magick by Lia Davis, and many more stories. WOULD LOVE TO READ DOVER DEMON, EMERALDFIRE, AND COMANCHE VAMPIRE! On Oct 26, 2015, evna said: Awesome! I would like to read The Kiss of a Rose by Augustina Van Hoven, Breaking Her Rules: Beyond the Cage by Jennifer Snow, Unmasking Love by Peggy Bird, The Widow's Walk by Carole Ann Moleti, Counterfeit Countess by Cheryl Bolen. Those are the books that I'm interested in. On Oct 26, 2015, greenshamrock said: Oooh books!!! So many great sounding books... Bear Magick by Lia Davis, Counterfeit Countess by Cheryl Bolen, and A Pirate's Command by Meg Hennessy have my attention. Thanks, NOR for all the giveaways & the excerpts you show on your web site for all of us book lovers. Now, I always have more books & new authors to add to my TBR list, thanks to all of you. The scavenger hunt is a awesome idea. So many new authors, books, and exciting giveaways. Thanks for all you do for the readers. Can't wait to get several new books I found through this scavenger hunt. A School for Unusual Girls by Kathleen Baldwin, Counterfeit Countess by Cheryl Bolen and A Pirate's Command by Meg Hennessy are just a few of many that caught my interest. Thanks for the fun contest and a great way to find new authors. Hallowpalooza gives me more authors and books to look for and read. I love finding new authors to try. On Oct 25, 2015, gecko said: Thanks! I want to read the Zoe Dawson box set. Thank you! I enjoy these scavenger hunt contests! Tons of great books. Since choosing just one, I'll go with Bear Magick by Lia Davis. Thanks. Many interesting books. Lethal Union by Vanessa Liebe, Song of the Ancients by Sandy Wright and The Dover Demon by Hunter Shea caught my particular attention. On Oct 24, 2015, LBelle said: A new record! The "palooza" contests include such a variety of genres. This one added 16 new author pages to my favorites links! I love this. So much fun and I get to add to my list. Found lots of new authors and interesting reads! Some of these books sound great! thanks for the contest. On Oct 23, 2015, VampedChik said: Great giveaways! I found so many new books to read! Thank you so much! On Oct 22, 2015, Heather S said: Awesome Giveaway! Loved the contest. It was lots of fun. Found new books by some of my favorite authors. And some new books that I need to check further. On Oct 22, 2015, Tamazon said: Having Fun! We hope you are all having fun with this event. We love sharing books with you all. So many great authors to choose from! Oh, where to start, where to start! Thanks for all the great excerpts! On Oct 21, 2015, Beccasmom said: books!!!! Love these hunts!! I always find something new to read! So many new and exciting authors and books to read. Can not wait to add these books to my stack for reading over the long winter months! So many fascinating blurbs, I was particularly intrigued by the variety of ghost stories, so apropos for the season! Wonderful sweeps and great way to find new reads AND new authors (not to mention a chance to win a great prize!). Thank you!!! What a fantastic event! So many wonderful books and authors to add to my TBR list. Thanks NOR for sponsoring the Hallowpalooza. Never done one like this before. Definitely found some books to put on my Amazon wishlist! =) I count at least 8 of them. Lots of interesting sounding books in this month's contest. All of these books look great! i would love to read Carnal Beginnings by Reily Garret, song of Ancients by Sandy Wright, the Heartbeat thief by AJ Keaton. Thanks for the contest and these great books. On Oct 16, 2015, Sable said: Great fun! Thank you for this contest and all these awesome books, some from authors I have not read before. Lots of great books, had a good time and found this hunt so much easier that the last one...Happy Halloween! finished my entry...really would love to win! On Oct 15, 2015, mshigh said: Great Contest! Love this fun contest that brings us new authors and exciting new reads! So many fantastic authors and books that are new to me! Thank you for the introduction, Night Owl Reviews! On Oct 14, 2015, Cheryl said: Nice! Great books and nice prizes for the Hallowpalooza! Thanks! I enjoyed doing the hunt and learning about books and authors. On Oct 13, 2015, Hitherandthee said: Great hunt! Another fabulous scavenger hunt! There are so many great books and prizes! The books that are calling me the loudest are The Legend of Lady MacLaoch, and Emerald Bound! Another great scavenger hunt. I look forward to reading Cheryl Bolen and Joanne Jaytanie. 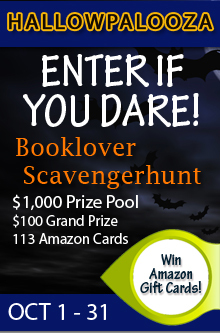 I love these scavengerhunts they are so much fun and introduce me to so many new authors! so little time. finally just entered for those that i have a fighting chance of reading! On Oct 12, 2015, thereadingrebel said: Had Fun! I found three books I want to read A school for unusual girls, Blood Tide and The Heartbeat Thief. I had great fun doing this hunt. I would like to check out the book Lethal Union. The book sounds interesting. What better way then a scavengerhunt to discover all these new books. I always find such awesome books & authors @ Night Owls.... love this site! On Oct 11, 2015, zuagy said: Hallowpalooza! I am interested in Counterfeit Countess and the other historical romance books. There were a few paranormal books that were interesting to me too. I'd be interested in reading the historical romance books. Some titles I found are: Lethal Union, Widow's Walk and Counterfeit Countess. I found some interesting titles and authors to explore. On Oct 11, 2015, booksforme said: SO many new books to choose from! There are so many books I want to read now..Forsaking Gray, Dark Summoner, Bear Magick, and Breaking Her Rules to name a few. I bought A pirate's command, just could not wait for that one. I'm looking forward to reading Songs of the Ancients, The Kiss of a Rose and School for Unusual girls. On Oct 10, 2015, Truanimefan said: So many great authors, so many awesome books! There were so many awesome books from so many great authors to choose from. I already owned a few of the books and purchased several more. I wasn't able to get them all but I did put them on my wish list for later. I can't wait to read them all. There were so many great books offered its hard to choose any one as my favorite. Look forward to the next great selection of books and authors. I loved the contest and am so looking forward to reading many of the books. They sound so awesome! So many great Authors, I have a list of books I want ! Thank you to All the Authors for a great giveaway ! Hunts are so fun. Lots of interesting books for sure. I really love these hunts.....I always add to my Amazon wish lists.....just need a gift card to help me get them all. Ohh I found many books that are perfect for the season and many from my favorite genres too . Thank you so much. So many that I want to read, Forsaking Gray, Carnal Beginnings, Blood Tide and The Kiss of a Silver Rose are a few. Thanks! On Oct 08, 2015, DarcNina said: Great Supernatural/Creature Reads! I can't wait to dig into the supernatural/creature reads. The Dover Demon by Hunter Shea sounds fantastic!! Thank you for this wonderful chance! I could use some book money! I'm reading an ARC of SCHOOL FOR UNUSUAL GIRLS now, actually! Such a fun scavenger hunt! I love this game! I discovered a few new authors to seek out in the future and I'm looking forward to adding to my TBR pile! On Oct 07, 2015, bevieann said: I love scavenger hunts!! It makes it so exciting! And I find books and authors that otherwise would remain unknown to me! i found more than a few books that I will definitely be checking out. I love the variety of featured books. Scavenger hunts are so much fun--- it is very generous of the authors and NOR for all the prizes. Hunter Shea is the man, definitely an underrated writer! I'm loving all of these new books! If I hadn't entered the contest I never would have read about them. Thank you! Great wait to read these books and find new authors. I can't wait to read Kiss of the silver wolf by Sharon Buchbinder and Blood Tide by CJ Mathews. On Oct 06, 2015, momofsteele said: Great books I found! Here is the list I wrote down that I added to my TBR: Sandy Wright, Song of The Ancients. C.J. Matthew, Blood Tide. Beth Caudill, Healer's Fate. I already own and read Chasing Victory by Joanne Jaytanie. Suzanne M. Sabol, The Blushing Death series. Liz Davis, Bear Magik 2. Meg Hennessy, A Pirate's Command. Becky Banks, The Legend of Lady Maclaoch, and Teresa Richards, Emerald Bound. Thanks for exposing us to "new" authors! On Oct 06, 2015, amandastar said: Thank you! This is such a great way to find new authors and books! I've found so many interesting books to check out. On Oct 05, 2015, mamamorr said: Thanks!! Love these contest!! Find so many new authors!! Always great contests here, you can find many great new authors. I always add to my TBR list. Thank you for the opportunity. There are quite a few books that I would love to read. Thank you for an awesome giveaway!! I love this kind of hunt! It makes thing pretty fun! And such good reads... no way I'm missing them. On Oct 05, 2015, StarDust said: So many good reads! Black and Shadow, the Rancher And The Renegade, and Counterfiet Countess peaked my interest. What an awesome giveaway! Thanks for the chance to win. What an eclectic group of stories. The all sound sooo intriguing. It is too hard to pick just one book.... oh, woe is me. thanks for the wonderful opportunity with this sweepstakes/giveaway. Kelsey and Nancy! I love the Grannies! This was great seeing all the books and reading from each of them! On Oct 04, 2015, belgre said: New Authors and Lots of Fun! I think I'll be checking out K.L. Kreig in the future. I liked the Forsaking Gray blurb and will be adding it to my TBR list. I love these events. There are so many great books to choose from but I have a hard time figuring out what to read first. Awesome giveaway, thanks for the chance! I look forward to reading Eidolon by Ruby Duvall, Blood Tide: Dolphin Shore Shiftrs by CJ Matthew, Breaking Her Rules: Beyond the Cage by Jennifer Snow, A School for Unusual Girls by Kathleen Baldwin, and a few others! I have not yet read any of the books listed. I am not familiar with most of these authors so I am looking forward to reading these books. Thank you for having another hunt. It's fun looking for the clues. Emerald Bound by Teresa Richards look interesting. I love the hunts! I want to read Song of the Ancients by Sandy Wright. These scavenger hunts are so much fun! I enjoy finding new authors to read and add to my TBR pile! by Roberta Grimes & Mikey Morgan. On Oct 02, 2015, Sylvie said: Fun As Always! I always find several must-read writers when I do these scavenger hunts. This time around, I'm looking forward to reading Ruby Duvall and Sharon Buchbinder. I found so many great authors and many books that are on my TBR list. Thanks so much for another great contest. On Oct 02, 2015, zippykim said: Love a great giveaway! Thanks for an awesome giveaway! Lots of new authors for me! I have found several books that I would like to read including Bear Magick by Lia Davis, Kiss of the Silver Wolf by Sharon Buchbinder, and Blood Tied by CJ Matthew. Love your contests! There was so many!!! There were time travel ones that all looked good, I bought one so far. Thanks for the chance to extend my TBR pile!! A Pirates Command by Meg HennessySchool For Unusual Girls by Kathleen Baldwin. Thanks for this giveaway. I was unable to enter the answer in one of the entries because Rafflecopter closed when I hit wrong button. What an awesome list of authors!!! Let the Halloween fun begin. I really love all these contest. It gives me a chance to get to know all these authors. On Oct 01, 2015, dkolins said: Awesome!!!! So many great choices! I would pick Spirit Fall by Tessa McFionn, Fit To Be Tied by Nancy Naigle and Kelsey Browning, Bear Magick by Lia Davis and Counterfeit Countess by Cheryl Bolen. All treats, no tricks! I can't wait to read Counterfeit Countess by Cheryl Bolen, A Pirate's Command by Meg Hennessy, The Widows Walk by Carole Ann Moleti and Breaking Her Rules by Jennifer Snow. They all sound great. I think Meg Hennessy would be most interesting. On Oct 01, 2015, Soda said: I love these giveaways!! Thanks for the chance and for getting together all these wonderful authors. Some of them are new-to-me so I'm really enjoying finding new authors and their books. Thank you for a wonderful opportunity. I really enjoyed finding new authors and new books to read. On Oct 01, 2015, bevieann said: Wow a lot of cool books!! I found a lot of very interesting books by some new authors I look forward to checking out! I always love the NOR hunts. I find so many new authors. Thanks for the giveaway! This is a great hunt. I can't wait to read The Rancher and the Renegade by Jackson D'Lynne. I love these hunts because I end up adding so many books to my TBR pile and finding so many new authors! Thanks for the giveaway! Chasing Victory really caught my eye. I am definitely going to find out more. but I'm most intrigued by the assassin historians in Time Untamed. I just love these Scavenger Hunts because I find all kinds of new authors. Loved this scavenger hunt! It was fun reading about so many new books and I found many new authors/books to try. Thank you! I really liked Eidolon 1 by Ruby Duvall. Sounds great. I absolutely love these types of events. Not only to win free stuff, but to get the chance to meet great, new and awesome authors that I probably wouldn't get to meet otherwise, so a big thank you for that! I've taken note of several authors I will be looking into for their books to add to my library, so that for that as well! I love scavenger hunts! They provide me with authors and books I may never heard of, and let's me get a chance at winning said books! Thank you for hosting it NOR! I loved Eidolon, Ruby Duvall, Fobidden plays, Zoe Dawson, Forsaking Grey looks good, some many I want to read!! Thanks for the incredible giveaway! On Oct 01, 2015, AnghelalaOhh said: Happy Hallowpalooza !! Thanks for another scavenger hunt! I really had fun scavenging the hidden words. I also found new authors and books to tbr. I liked The Kiss of a Rose by Augustina Van Hoven, as well the Dark Summoner by D.D Miers and Forsaking Gray by K.L. Kreig. Thanks to all the awesome authors, Happy Holloween! Love discovering all the new reads that are being showcased on this contest. no matter what all are winners. Thank you Night Owl Reviews for the great scavenger hunt for all of us. You Guys are the best. I have several books to add to my "TBR" wish list now. Like "The Legend of Lady MacLaoch" by Becky Banks and "kiss of the Silver Wolf" by Sharon Buchbinder. Thanks for the scavenger hunt! Now on my TBR list is Kiss of the Silver Wolf by Sharon Buchbinder. So many interesting books to add to my wish list! I couldn't narrow the list down small enough to remember every title. The best I can do is say that all of the books that don't consist of paranormal, sci-fi, fantasy are the ones I would really love to read. It isn't that I am against the above list, I did read the twilight saga, they just aren't what I normally go for. If I could though...I would love to get my hands on the rest! Thank you for having a scavenger hunt for Halloween!! For Flying High in Spirit check Roberta's author page. This book goes on sale on 10/1, so isn't on Amazon at this time. On Oct 01, 2015, frances said: Looking forward to cold winters nights now! I found several new authors that I am going to enjoy reading this winter while snggled up under a blanket in front of a fire!